A volunteer job in Africa the summer after her sophomore year in college helped Bonnie Joubert put her future in focus. “I’d never before traveled in a developing country, and the experience was eye-opening about how much we take for granted in the U.S., and also what joins everyone together across the world,” says Joubert. More than 10 years later, her path led to NIEHS’ epidemiology branch, where Joubert, 32, is a post-doctoral research fellow in the Genetics, Environment and Respiratory Disease Group. She works in epigenetics, a relatively new and rapidly progressing branch of science that looks at how factors, including the environment, affect how a gene functions by changing its expression rather than mutating its DNA. With other health project volunteers in Kenya, Joubert slept for three months on the floor of a boarding school. She still remembers fondly the students who gathered outside the windows each day to sing to the volunteers. “I shadowed doctors in hospitals where there were three people to a bed, where the blood pressure cups didn’t quite work, where electricity and even water were limited,” says Joubert. There, and the following summer in Gambia, she visited rural clinics and saw extremely ill people patiently waiting, often all day, to see a doctor. That first summer in Africa clinched it—she would work in public health. She had found her passion, and a cause for her idealism. During her senior year, she found her niche. Although she previously was unfamiliar with the term “epidemiology,” a course opened her eyes to the fact that the field matched not only her passion but her skill set. “Other people can do computing better than I can; some are better than I am in the lab,” Joubert says, “but I think my combination of skills bring something to the table.” Joubert earned her B.S. in biology at Tulane University, then her Ph.D. in epidemiology at the University of North Carolina, Chapel Hill. Joubert has worked on a number of projects on the team led by Stephanie London, M.D., Dr.P.H., including a recent study that found changes to several genes among babies born to mothers who smoked during pregnancy. 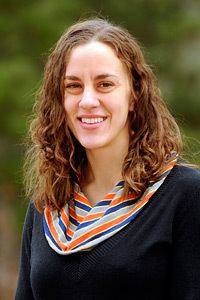 Much of her current work focuses on the pathology of asthma and lung function and includes data collected in Mexico City and Norway.